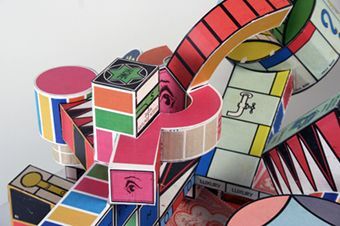 Sat 21 April  Sun 17 June Bracknell and Mirror Galleries Opening reception & live events Fri 20 April 6.30- 8pm Andi Chapple, Philip Lee and Katherina Radeva At Play 4 is an invitation to the spectator to play  with an active sense of freedom similar to a child at play. This finale of At Play explores play that is free and spontaneous or bound by rules and conventions and the spirit of the Olympics. The exhibition examines play as a way of surviving boredom and of discovering the insecurity of the world, and the effect of random chance. It relates play to drawing  perhaps the most direct and free form of artistic expression. Artists include Leszek Blyszczynski, Andi Chapple, James R Ford, Flora Gare, Rebecca Glover, Nick Kennedy, Philip Lee, Dan Lovelace, Sousan Luqman, Nyeema Morgan, Martina O'Shea, Katherina Radeva, Duncan Sellar, Guy Tarrant, Cally Trench, Kim Walker and Mary Yacoob. At Play is curated and produced by Outi Remes and Cally Trench. At Play 4 is in partnership with New Ashgate Gallery,Farnham and OVADA , Oxford and is sponsored by the Foundation for Contemporary Art At Play Artist Talk: Guy Tarrant www.guytarrant.co.uk Fri 20 April 5.306.30pm £10, Conc £8 Guy Tarrant's artwork challenges the formal processes of art. Guy's first concerns dealt with questioning the very nature of artistic authorship and professional practice. As Guy became more involved in teaching he shifted his attention to addressing the education process. He is concerned with focusing on the role and responses of participants' behaviour.